The Rainforest Garden: Rainforest, Indoors! 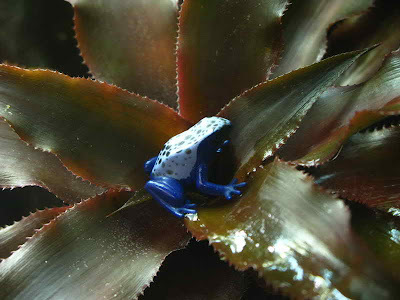 Thank you Stephania from the Gardenweb bromeliad forum for these amazing photos of her "Tropicarium"! There is no limit to what you can do with a little inspiration, determination, and in this case, talent! 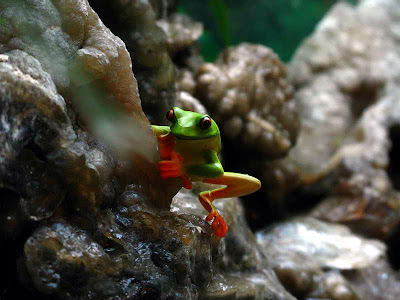 Most zoos don't have habitats as artfully created as this one, so these are some very lucky treefrogs. Note the careful selection of durable low growing plants used here: mondo grass, cryptanthus bromeliads and ferns are all used planted in individual containers for easy upkeep and maintenance, and they thrive on the moisture typical of terrariums. Obviously not everyone has the technical skills or funds to recreate this project to the tee, but here are some easier variations that still bring a miniature rainforest indoors. I made some illustrations to help. 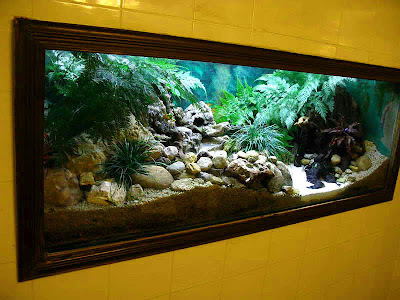 Aquarium Redux - Repurpose or buy a freestanding aquarium and place in a well lit area where it can be admired. Plug some small pots where the plants will go and fill the surrounding area with gravel and rocks. 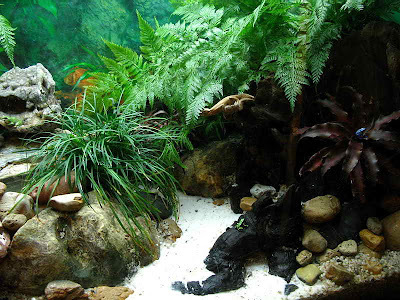 Place large houseplants like ficus to either side and let vines trail over and around the terrarium. Tabletop Garden - Find a large and flat tupperware container (like an under-the-bed type) and make a simple wooden frame to surround it. Fill the bottom with rocks or gravel for drainage and place your plants where appropriate, then filling in the remaining area with potting soil and covering with a mulch of gravel or orchid bark. You can either place this on top of a sturdy table, or build a table around it! A simplistic zen look with dwarf mondograss suits this plan nicely. Living Wall - You don't need one of those expensive kits for this look! Find a stud in your wall and install some hanging basket hangers, (available at your local hardware store) directly over each other so that when excess water drips down the other baskets catch it. Place a bucket underneath while watering if you're still worried about getting the floor wet. Plant the baskets with a variety of plants, making sure to use some trailing vines like philodendrons to really make it lush and natural. If you want a low maintenance answer, try bromeliads, which catch the water in cups so you don't make a mess and can water less often. I hope that this gives everyone some ideas, especially those who can't grow tropicals outdoors. Rest assured that I will have more ideas later! That's a beautiful "Tropicarium". 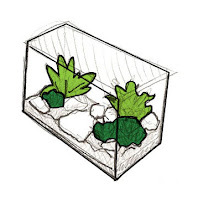 Making a terrarium is on my list of things to do someday. I've been thinking of making one for my husband's office. I don't think I'm up for such an extravagant one though. It looks so natural and lush. I can almost hear the frogs and crickets. Cool photos and great instructions! Those are amazing photos! That tropiquarium is prettier than art. I especially love the beautiful frogs! Right now, I am so tempted to jump on this project, but I know my husband would never go for it. 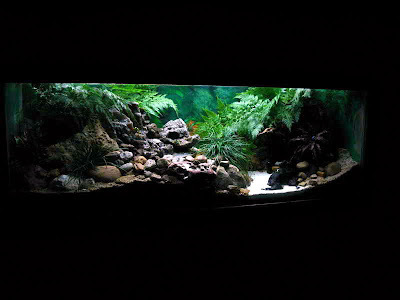 The giant fish aquarium I just HAD to have is a lot of work all by itself.